If you read me regularly enough, you’ve probably noticed: the shawl collar is one of my favorites. Feminine, versatile, wrapping, it is ideal for coats. 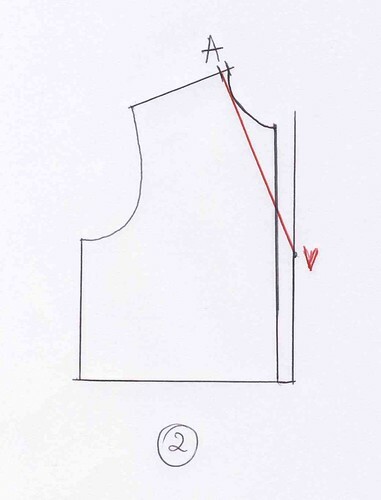 I give you here, step by step, the key to draw the pattern of your own shawl collar. You can add it to your bodice shell or to any other pattern that you do not like the collar. Roll up your sleeves and grab your pencil, ruler, squares and tracing paper. 1. 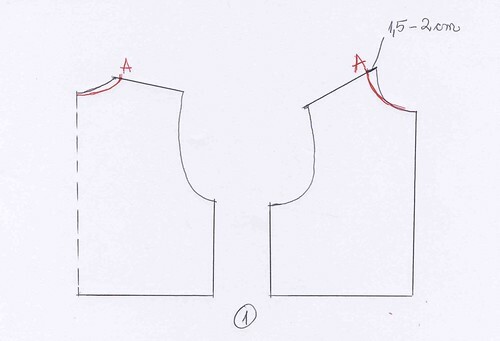 Expand your neckline with 1.5 to 2 cm on the shoulder line to the point A, on both back and front bodice patterns (Figure 1). 2. 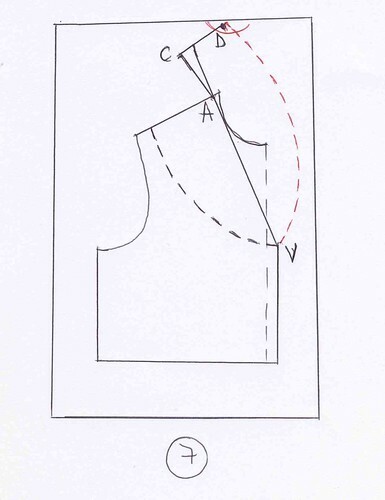 Draw the shirt placket 2 to 4 cm from the center front. The width of the shirt placket depends on the size of your buttons. 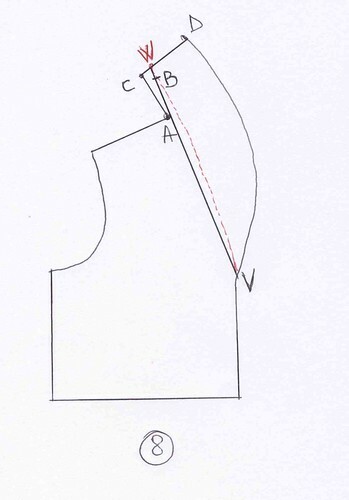 Decide the depth of your neckline, the point V, and trace AV (Figure 2). 3. Extend AV with AB = half-length back neckline (measure the extended backline, huh). 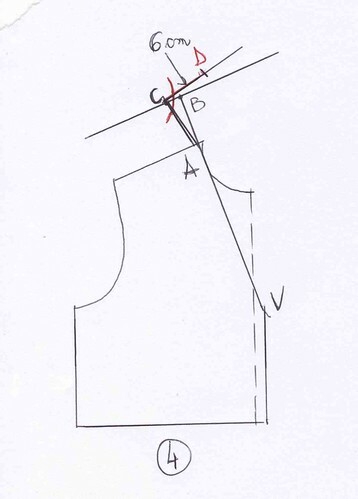 Draw the stand of the collar BC = 3 cm, parallel to the shoulder line and join A and C (Figure 3). 4. From point C, draw CD = 6 cm in a right angle with AC. This being the fall of the collar (figure 4). 5. 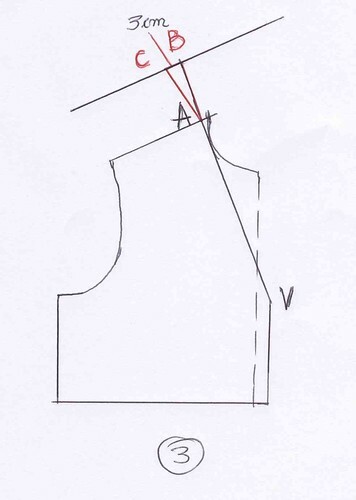 Draw the collar lapel between the point V and the shoulder line. Here, you can vary the shapes and widths. If you managed to survive so far, it would be a shame to restrain your imaginatrion (Figure 5). 6. Fold the paper on the AV line and copy the lapel. You will notice at this point the interest of transparent tracing paper (Figure 6). 7. 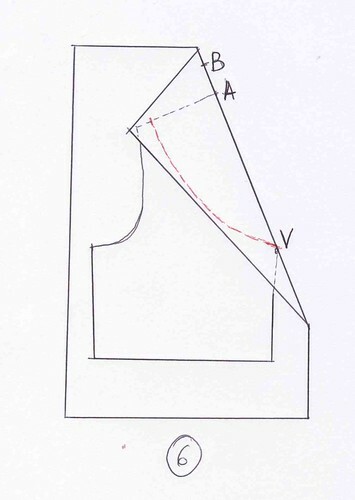 Unfold your paper, extend the lapel to point D at a right angle (Figure 7). You might need to lengthen or shorten CD. 8. Round the angles in point V. Extend the line VB to CD and mark this point as W. Join V to W by a curved line which passes more or less close to A depending on the fabric thickness. VW is the roll line of the collar. Your front bust pattern is now done (Figure 8). 9. From the shoulder line, draw a parallel line with VW and the shirt placket line. The width of your facing must be wider than the width of your shirt placket with at least 2 cm. Copy the facing pattern (Figure 9). Place the notches in the points A, V and W and add 1 cm of seam allowance to finished patterns. I think I have enough stuff here for geometry fans. For you, I have compiled two books “Flat Cutting: Volume 1” of T.Gilewska and “Sewing: make you own patterns” of Jo Barnfield and Andrew Richards. Soon I will do a tutorial on how to sew and apply this type of collar. This entry was posted in Patterns and tagged pattern, shawl collar. Thank you, thank you, thank you, lovely Cristina!!! You have saved me hours of pain trying to change a collar on a pattern. I started following you on Pinterest after reading your other helpful tutorials, and I am so glad I did! Thank you for the gift of your time and experience! Thank you so very much. I have been looking for someone to explain how to sew the shawl collar but I never got a site that did it so simple. God bless you for sharing. I am from Trinidad & Tobago. I, too, was so happy to see this lovely tutorial. Though not for the faint-hearted, it looks very clear to me. This will help me cut out the next dress with confidence. You lose me at step 3 and 4. I’m not really clear in your explanation on the rise and fall. Can you clarify it further please? 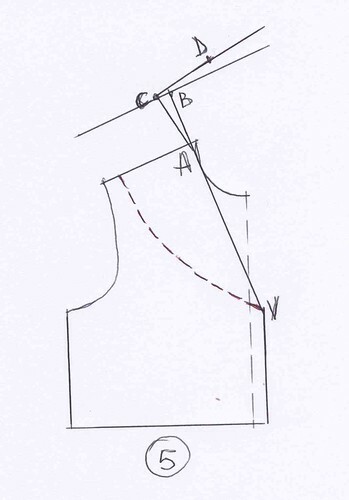 I thought you extend the AV line to 1/2 of the back collar measurement and move on to shaping the lapel. I’m not sure of which part I need to clarify, which phrase exactly is unclear? 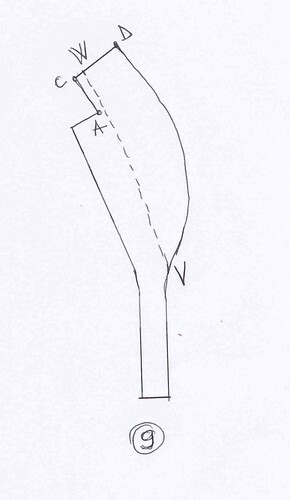 I extend the line AV and shape the lapel from point C.
I am not quite clear with extension of AV to AB. Could you please help me.. Thank you for sharing! I have a ready made leather coat that had a fur shawl collar that I would like to replace with a leather shawl collar any suggestions? Hi Cindy, do you need suggestion for what exactly? Hi tnxs for the tutorial but am confused on how u got the line above A were u have C,B please can u explain and how u draw the back. We’re u said extend Av-Ab and draw the back. I love this tutorial. Thank you so so much. Keep it up. Please do you have a book for beginers as a pdf file link to sujest for me to download? I will appreciate you share such file with me in my mail box. Thank u , it’s very helpful. I usually use my knowledge as an engineer in cutting. It’s been great and I do make a living from my passion with sewing, but having these is making cutting become a kidsplay. Thank you so much….was just waiting to know how to do shawl collar pattern. how would you do the collar if it attached to a longsleeve pattern? can i just follow your tutorial ? I really enjoyed your learning from your pattern drafts. Please can I have your email address so that i can talk you directly especially if i want to ask questions. Thank you. This is Awesome! So glad I found you! Thanks! Thank you so much. You saved me a lot of heartache! At long last, my dream is realised. Thank you very much . But, what is the total length , from C to D thorugh W? Thank you for clear these directions. Now, back to the drawing board. Several projects now proceed, Smoking jacket, Banyans, Dressing gowns, Waistcoats.